The Tang dynasty is considered by many people to be the golden age of Chinese civilization. Its emperors presided over one of the greatest periods of Chinese art, culture and diplomacy. Under the Tangs, China dominated the Far East in a generally amicable and peaceful way; Silk Road trade flourished; Christianity was introduced to China; and Buddhism became so well entrenched that the reproduction of Buddhist texts led to the invention of block printing and calendars. The Tang Dynasty was centered in Chang'an, a city established by the Han dynasty on the ruins of Emperor Qin Shi Huang's capital of Xian and developed by Sui emperor Wen Tu. Under the Tangs, Chang'an became a thriving metropolis and center of international trade filled with merchants, foreign traders, missionaries from numerous religions, acrobats, artists and entertainers. It was the largest city in Asia, perhaps the world, with a population of around two million people at a time when no city in Europe had a population of more than a few hundred thousand. The city was linked to the rest of China through a network of canals and toll roads which brought more riches and taxes into Chang'an. New inventions from the T'ang dynasty included the magnetic compass, gunpowder, the abacus, printing, and cataract surgery. 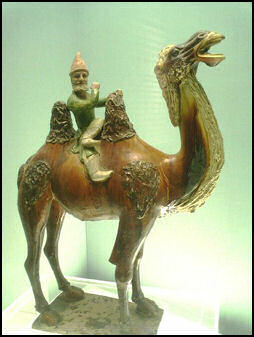 Silks, porcelain and art were traded for spices, ivory and other goods along the Silk Road caravan routes. Sea routes took Chinese goods as far away as Africa and the Middle East. Li Yuan was Duke of Tang and governor of Taiyuan during the Sui dynasty's collapse, which was caused in part by the Sui failure to conquer the northern part of the Korean peninsula during the Koguryo–Sui War. He had prestige and military experience, and was a first cousin of Emperor Yang of Sui (their mothers were sisters). Li Yuan rose in rebellion in 617, along with his son and his equally militant daughter Princess Pingyang (d. 623), who raised and commanded her own troops. In winter 617, Li Yuan occupied Chang'an, relegated Emperor Yang to the position of Taishang Huang or retired emperor, and acted as regent to the puppet child-emperor, Emperor Gong of Sui. On the news of Emperor Yang's murder by General Yuwen Huaji on June 18, 618, Li Yuan declared himself the emperor of a new dynasty, the Tang. Li Yuan, who became known as Emperor Gaozu of Tang, ruled until 626, when he was forcefully deposed by his son Li Shimin, the Prince of Qin. Tang Taizong is one the most admired Chinese leaders and is known for his love of art. He so admired the calligrapher Wang His-chi he took his famous work “Preface to the Gathering at the Orchid Pavilion” with him to his grave. Tang Dynasty China under Emperor Tang Taizong prospered under the peaceful development of the Chinese econo. Taizong emphasized in the welfare of his subjects, promoted a policy of low taxes and fair treatment to the frontier minorities. The T'ang dynasty was one of the most militarily powerful of all the Chinese dynasties. It expanded the Chinese empire across the Great Wall of China and beyond the Himalayas. At its height, it administered much of present-day China and exerted control or received tributes from a dozen other kingdoms, including those in Korea, Tibet, Mongolia, Japan, Indonesia and most of Southeast Asia. The Tangs ruled with a pyramidal administration system consisting of the Emperor, and three main ministries at the top. Underneath them were nine courts and six advisory boards. To discourage warlordism and establish regional power bases, China itself was broken down into 300 prefectures and 1,500 counties, a system which persists to this day. Advances to the West by the Tang Dynasty were slowed by the Turks in the late 7th century. In 751, in the Battle of Talas, Tang Chinese forces attempting to extend the Chinese empire into Central Asia but were annihilated by a Muslim army not far from Samarkand in present-day Uzbekistan. The defeat kept the Chinese out of Central Asia and opened up Central Asia and Western China to Islam. The Tang emperors were known for their openness to new ideas about art, religion, philosophy and music that were brought in by foreigners who flowed into China along the Silk Road trade routes. Unlike most Chinese dynasties which tried to cut off their empire from influences from the outside world, the Tang ruling families tolerated outsiders and members of variety of religious sects. Cosmopolitan culture flourished. Tens of thousands of foreigners lived in major Chinese cities. Women held high government offices, played polo with men and wore men's clothes. Chinese intermarried with nomadic peoples. Foreigners such as Turks rose to high positions in the civil service and the military.The economy changed a great deal in the Tang and Song dynasties, going from what was basically a subsistence economy to one in which peasantry was active in local and long-distance trade and non-food crops such as silk were produced on a large scale. Taoists, Confucian scholars, Nestorian Christian missionaries, Zoroastrian priests and Buddhist monks, among them ones who helped found Zen Buddhism in Japan, all felt comfortable in Tang era China and practiced and to certain degrees proselytized their religions. Tang Buddhist sculpture Buddhism reached its height in the Tang Dynasty. Doctrines were refined. Schools expanded. The Pure Land School and the worship of Amitabha became widespread. Many Tang emperors were Buddhists, or at least nominally favorable to Buddhism. Some great Chinese poets from the period were monks. Many Indian and Central Asian monks and pilgrims came to teach in China. Chinese pilgrims was sent to India to study Buddhism. The Indian culture made great inroads, when Buddhist philosophy accompanied by the Indian arts of astronomy, mathematics, medicine, and philology. Chan (a school of Mahayana Buddhism combined with Taoism, which gave birth to Zen in Japan) was the dominant sect. Famous Chan monks from the Tang era include Mazu Daoyi, Baizhang, and Huangbo Xiyun. 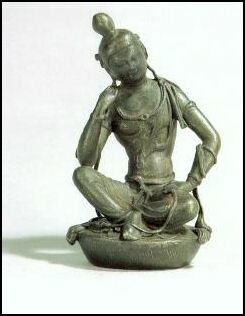 Pure Land Buddhism initiated by the Chinese monk Huiyuan (334–416) was also popular. It fused with Chan Buddhism after the Tang Dynasty. Towards the end of the Tang dynasty, Chinese emperors began to favor Taoism over Buddhism;. monks and nuns were secularized; temples and libraries were destroyed. The prominent status of Buddhism in Chinese culture began to decline as the dynasty and central government declined as well during the late 8th century to 9th century. Buddhist convents and temples that were exempt from state taxes beforehand were targeted by the state for taxation. In 845 Emperor Wuzong of Tang finally shut down 4,600 Buddhist monasteries along with 40,000 temples and shrines, forcing 260,000 Buddhist monks and nuns to return to secular life; this episode would later be dubbed one of the Four Buddhist Persecutions in China. Although the ban would be lifted just a few years after, Buddhism never regained its once dominant status in Chinese culture. Buddhism remained overshadowed by Taoism and Confucianism until it experienced a revival in the 11th century. Nonetheless, Chán Buddhism gained popularity amongst the educated elite. The Tangshu (Old Book of Tang) compiled in the year 945 recorded that in 828 the Tang government issued a decree that standardized irrigational square-pallet chain pumps in the country: In the second year of the Taihe reign period , in the second month...a standard model of the chain pump was issued from the palace, and the people of Jingzhao Fu (d footnote: the capital) were ordered by the emperor to make a considerable number of machines, for distribution to the people along the Zheng Bai Canal, for irrigation purposes. The humiliations that resulted from the annihilation of the Tang forces at the Battle of Talas destabilization that occurred during the An Shan Rebellion revealed weakness of the Tang Dynasty and opened it up to further rebellions. In the 9th next century, both peasant revolts and foreign incursions increased, while more autonomous power was passed to provincial rulers as the centralized Tang state slowly collapsed. During the Tang dynasty arts and ideas flourished when record rice harvest were being recorded, but the entire dynasty began to collapse when the rising population began to outstrip the food supply. An Arab traveler to China at end of the Tang dynasty wrote that “Chinese law permits the eating of human flesh, and this flesh is sold publically in markets” as a means of providing enough food. n the last decades of the Tang Dynasty, the weakened central government largely withdrew from managing the economy, though the country's mercantile affairs stayed intact and commercial trade continued to thrive, at least until agrarian rebellions in the latter half of the 9th century brought the dynasty to its knees, resulting in damaging atrocities such as the Guangzhou Massacre (879), in which thousands were killed, including many foreigners. In much of the late 8th century the Tang Dynasty was in decline. In the 9th century disputes within the court grew more acrimonious and the Tang dynasty weakened further. Though a Tang emperor occupied the throne until 907, by the 890s most of the empire was in the hands of independent and ambitious military leaders. Invaders from the north destroyed the Tang dynasty in 907, and China once again was thrown into a period of anarchy and disunity that lasted this time for about a half a century. After the Tang Dynasty collapsed the empire split into ten kingdoms, and would remain fragmented until its reunification under the Song dynasty.